Look at this, February's review only a week after January's and only two months late 😁. So what happened in February? Well lots more running, and I mean a lot more, oh and a great race with a new PB. February 2017 was my third largest month ever after last month and August last year which is pretty amazing considering the month only had 28 days. It just goes to show how much mileage I was putting in, and with relative ease. I continued to put in the big miles, keep the double-run days three times a week and the two medium-long runs, and I also introduced more intensity in the form of intervals and lactate threshold pace runs on Tuesdays. The intervals I did were 5x 3 minutes at 3K PB time with 3 minutes of very easy running for recovery between each. These are meant to be good for increasing VO2Max and I found them a good challenge but not too exhausting. The lactate threshold runs were relatively short - ~6-8K at 15k-21k pace - and also pretty challenging. Of the two intensity workouts, I definitely prefer the intervals, which probably says a lot about where my fitness and strengths lie. February also gave me my first opportunity to put my training to test and see how it translated into racing performance. How did it go? Freaking brilliantly. I smashed my previous half marathon PB by nearly two minutes on a cold and breezy morning in Wokingham on the 12th. I've been working really hard on upping my mileage and this was the first test of the season. I didn't know what kind of shape I was in other than "definitely better shape than last year, and possibly PB shape" so I set off with the goal of about 78mins in mind. Other than a few little points in the course where things got windy or a little hilly, I managed to keep on pace and felt really comfortable too. I went through half way feeling really good and was tempted to go for it a bit more but decided to hold back a little as I knew there was a bit of a hill in the last 5k which many people forget about when heading out. With about 6km to go I finally decided I'd start to push things a bit, motored up the hill between 16 and 17ks before really knuckling down and pushing hard to the finish. Finished in a new PB time, by nearly 2 mins, of 1:17:34 gun time and 1:17:31 chip time. Chuffed to bits that my training is going so well this early in the season. Manchester Marathon and Comrades should be a blast if all keeps going to plan. To top it off, I didn't taper for this race other than cutting Saturday's run to 30mins instead of the planned ~45mins, and the race also took the total for the week to 132k. Training on the Monday after wasn't a challenge either and that week I continued to increase my mileage. 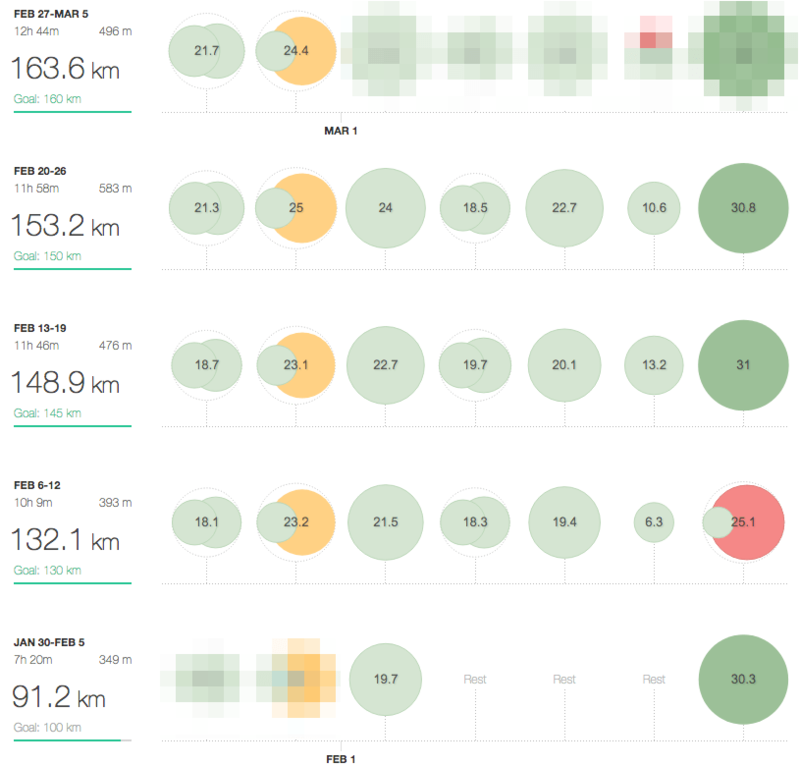 The only thing that didn't happen in my training in February was a 100 mile week, though the last week which crosses into March was a 100 mile week, and a new largest week ever. In summary, keeping the three double-runs, the two medium-long runs and introducing the intensity workouts is continuing to payoff and I'm adapting well to the load and demands of my training incredibly well.